October is National Violence Awareness Month, and this week, we’re spotlighting an artist who was left paralyzed by random gun violence. Mariam Paré is a painter, and when she could no longer use her hands and arms, she taught herself to paint by holding the brush in her mouth. She recently set out on a seven-city tour of the U.S., including a stop in Los Angeles, to raise awareness for the Mouth and Foot Painting Artists. 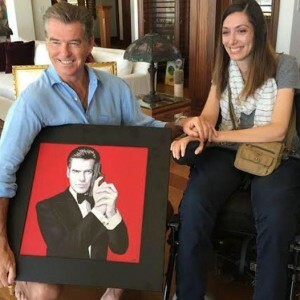 Her work also caught the attention of actor Pierce Brosnan, who invited her to his Malibu home. To learn more about their meeting and Mariam’s incredible story, be sure to check out our story below, airing statewide this week on California Life.